Have a kiddo that geeks out on all things Star Wars? 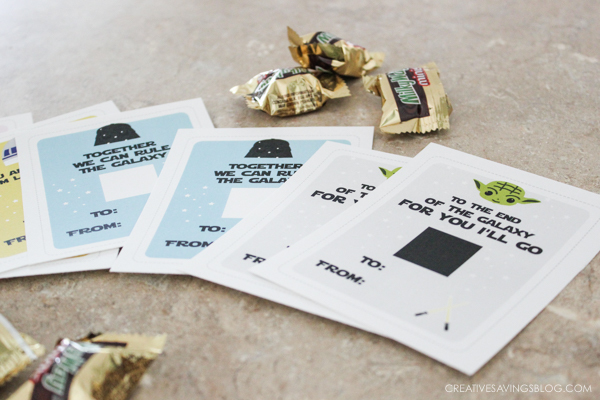 Skip the overpriced boxes at the store, and download these printable Star Wars Valentines instead. Great last minute option that's still cute and creative! Valentine's Day was one of my very favorite days in elementary school. The teacher would each give us a brown paper bag to decorate and stick on the sides of our desks. Then everyone would walk around and drop their carefully prepared valentines into each of the bags. I couldn't wait until the teacher finally let us explore all our goodies after lunchtime! If your kiddos look forward to this day too, then you've probably done the store bought valentines before. Depending on how many are in each class, and what cartoon character is trending for the year, you can easily spend $20-$30 just on Valentine's Day cards and supplies alone. 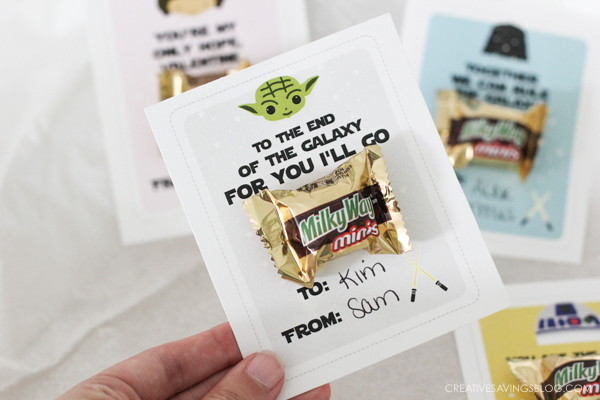 These Star Wars Valentines are FREE to print — all you have to do is buy a bag of Milky Way minis to complete the galaxy theme. It's the perfect last minute option that's still cute and creative! 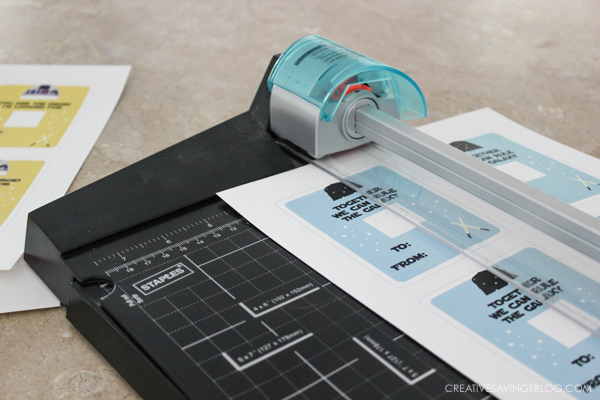 Step 1: Print out each design on heavy duty card stock paper. This is important since we're going to attach a slightly heavier object to it! Step 2: Cut valentines apart with a paper trimmer. I probably left about 1/4 – 1/2 inch around each card, but honestly, I just eyeballed it. Step 3: Attach Milky Way minis to the square on each card. I used Glue Dots so I was sure they wouldn't fall off. Your kiddos would have a lot of fun helping with this part! Step 4: Fill out the To/From section on each valentine, and give! 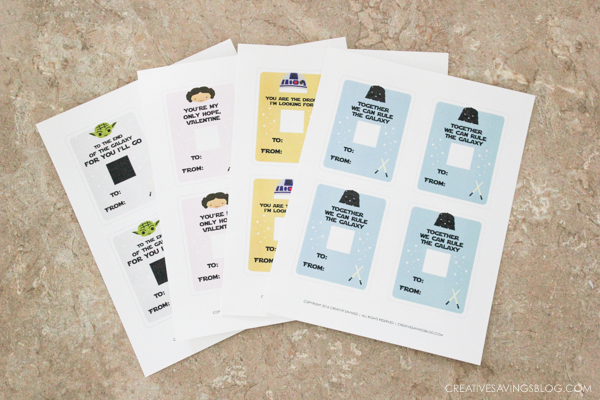 To download these printable Star Wars Valentines, pop your email address into the box below, and I'll send all four of them straight away. Sometimes these things get lost in your spam folder, so make sure you check there if you don't see them within the hour. And of course, please email [email protected] if you have any problems! I'd love to know if you printed and used these valentines, so take a pic and share it with me on social media. You can tag me on Facebook, Twitter, or Instagram. I can't wait to see your creations! What cartoon characters are your kid's favorite? What an idea? Just love them. Wish everyone gives me just that. The Valentine is going to be fun for sure. These are super cute. I have tried entering my name and email but never received anything. I tried it again and still nothing… Any way someone can help me. My little girl loves these. I am trying to enter my name and email address into the Star Wars Valentine download window. For some reason my computer will not let me open the window to type in. If you could please send them to me, I would appreciate your efforts. 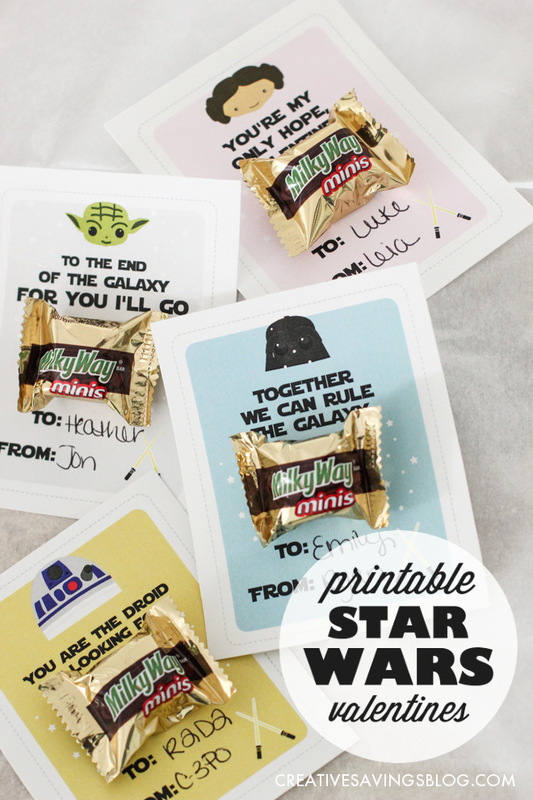 My daughters are Star War geeks and would love these Valentines. We seem to be having an issue with our forms today. Thanks for leaving a comment and letting me know. 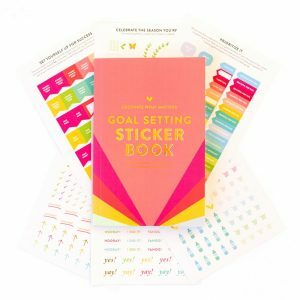 You should have an email in your inbox from Joseph with the printables! I LOVE Star Wars Valentines! I entered my name and email but did not receive an email. If you could PLEASE send them to me. For some reason the Star Wars Valentines keep ending up there for many subscribers. If it’s not there, send an email to [email protected] and he’ll take care of you right away. Tried twice to get these cute valentines and I’ve double checked my junk folder. Can you please email them to me. Hi Cassie! I think we finally have the problem resolved – You should have an email now with the valentines! Hi- I signed up to have the Star Wars Valentines emailed to me, but never received the download. Can you please send me some? They’re so cute! For some reason I can’t get these to print 4 on a page. I get 1 and a 1/2. How do I change that? These are so cute that I definitely want to use them! That’s strange. When you go to print, click on settings or preferences and look for a “size to fit” check box. If that doesn’t work, email [email protected] with what kind of computer you have (Mac or PC) and what size paper you are using, and I’ll have someone troubleshoot it for you! Hi! I entered my email address about 15 minutes ago and haven’t gotten anything yet – just wondering how long of a delay I should expect? Thanks – these are awesome!! Hello, I signed up to receive the Star Wars Valentines…they are so cute!!!!! I have not received an email yet. Can you help me out? These are super cute. I have tried entering my name and email but never received anything. I tried it again and still nothing… Any way someone can help me. Send an email to [email protected] and we’ll get you taken care of. Hi these star wars valentines are awesome but everytime I put my email address in nothing happens. Sorry for the trouble! Joseph just sent them to you directly.